With last winter’s snow only recently melted, green grass and soccer balls fill the air as men’s soccer gets underway. This year the guys are looking forward to finishing high in the MVC division and building a strong team. With their season last year ending with a 12-8-1 record and a loss to Ankeny in the first round of State, the team is working hard this winter to prepare. “For the better part of the winter they have had the opportunity to play in the gyms on Sunday nights. 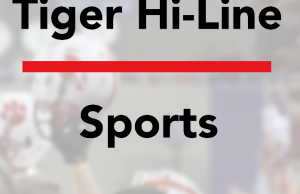 There are also a bunch that have played in a league in Cedar Rapids and in our local Panther Pride indoor league at UNI, but this week they are playing up at Wartburg just to keep getting touches on the ball,” Head Coach Josh Printz said. The team also has been working other goals such as building teamwork and endurance for the games. 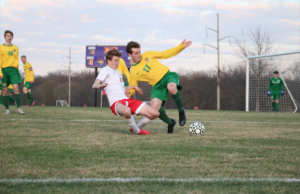 “If we come to play, stay focused every game and work harder in practice to prepare ourselves and be able to play 80 minutes and not just 40, we will go far,” Printz said. The team also looks to compete well with their big rival, Waterloo West. “It’s a great group of guys that knows how to push each other as a group as well as challenge us coaches to constantly improve,” Printz said. The team this year has also expanded, as about 80 kids are expected to try-out, and 11 varsity will be returning this year. “We have a large group of freshman coming out this year. From what I have seen, we have over 25 coming out this year,” Printz said. Practice started March 22 for the team. The team’s first game is April 8 against Cedar Rapids Washington and is away.